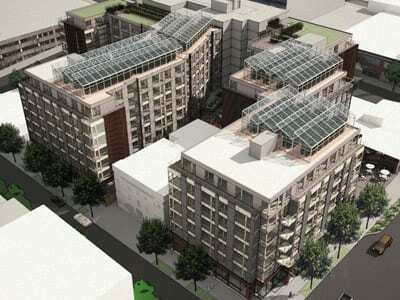 The future of rooftop agriculture above Capitol Hill? 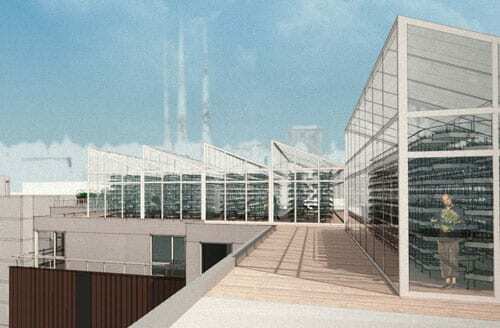 If you’re a fan of urban agriculture, urban design, or just enjoy a bit of urban futurism, check out these decidedly fictitious plans for a roof top farm in Capitol Hill. Architects at Weber Thompson dreamed up the commercial sized hydroponic farm as a submission to the Seattle Architecture Foundation’s 16th Annual Exhibit, WORLD CITY. The prototype farm is designed to sit on top of the future Pike Mortorworks building, also designed by Weber Thompson. In our exploratory design models, the Pike Motorworks building, which contains retail and residential space, is given an unexpected twist in which the rooftop becomes a hydroponic commercial urban farm installation. Instead of consuming, the building actually ends up contributing, in the form of fresh produce for the occupants, the neighbors, and the city. As our urban centers grow, so too will our need for access to fresh food, which is why we believe that urban agriculture is a viable solution for creating vibrant, self-sustaining cities that fit within and support their global community. Even without an urban farm, Pike Motorworks is one of the most ambitious projects planned in Pike/Pine and just got a re-start after developers at the Wolff Company put the project on hold earlier this year. The massive seven-story, 260-unit mixed-use apartment project at Harvard and Pike will transform a former BMW dealership into housing, restaurants and shops. A representative from Wolff confirmed the farm designs are not part of the actual building plans. However, the real plans do call for rooftop gardens. We’re thinking the more ambitious Weber Thompson plans might be worthy of consideration. You can learn more about the prototype by attending the SAF’s annual exhibit on Sept. 19th. This entry was posted in News, etc. and tagged architecture, design, development, gardening by Bryan Cohen. Bookmark the permalink. You’ve got a big supported for this brilliant project right here! So… if it’s designed and they are the developers of the project, why not build it? maybe its just a concept model, but I know there is an engineering class somewhere that would design this and a few dollars in some budget for an engineer’s review. Make it happen? That’s great but the thing I like best about this project is the way they broke up the buildings to avoid a canyon effect from the street. It’s that canyon effect happening on the Hill and in Ballard that I do not like. Livable cities do not turn all their streets into artificial canyons.